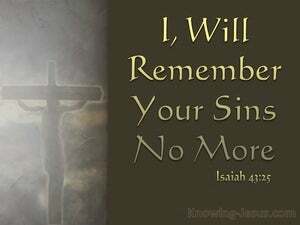 ﻿ Isaiah 43:25 "I, even I, am the one who wipes out your transgressions for My own sake, And I will not remember your sins. "I, I am the one who blots out your transgression for my own sake, and I'll remember your sins no more. I, even I, am he who blots out thy transgressions for my own sake, and I will not remember thy sins. I, even I, am he who takes away your sins; and I will no longer keep your evil doings in mind. I, I am He that blotteth out thy transgressions for mine own sake, and I will not remember thy sins. I, even I, am he that uproots thy rebellions for mine own sake and will not remember thy sins. 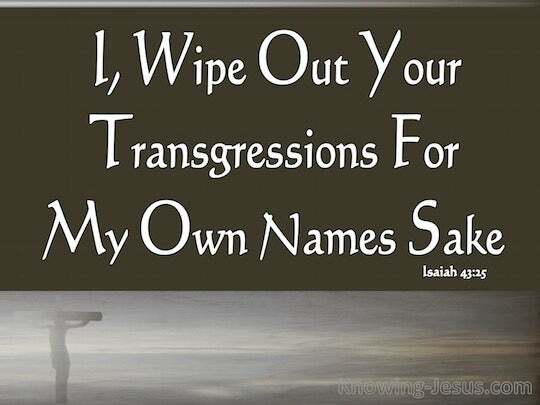 I, I am he wiping away thy transgressions for my sake, and I will not remember thy sins. 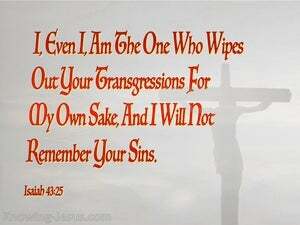 I, even I, am he that blots out your transgressions for my own sake, and will not remember your sins. I, I am the one who blots out your transgressions for my sake, and I will not remember your sins. I, I am He who blots out your sins for My own sake, and will not remember your sins. Whereas I yet am even he only, that for mine own self's sake do away thine offenses, and forget thy sins: so that I will never think upon them. I, I am the one who blots out your rebellious deeds for my sake; your sins I do not remember. I - I, am he that is ready, To wipe out thy transgressions for mine own sake, - And, thy sins, not remember. I, even I, am he that blotteth out thy transgressions for my own sake, and will not remember thy sins. I -- I am He who is blotting out Thy transgressions for Mine own sake, And thy sins I do not remember. 24 "You have bought Me not sweet cane with money, Nor have you filled Me with the fat of your sacrifices; Rather you have burdened Me with your sins, You have wearied Me with your iniquities. 25 "I, even I, am the one who wipes out your transgressions for My own sake, And I will not remember your sins. 26 "Put Me in remembrance, let us argue our case together; State your cause, that you may be proved right. "You have not heard, you have not known Even from long ago your ear has not been open, Because I knew that you would deal very treacherously; And you have been called a rebel from birth. "I am not doing this for your sake," declares the Lord GOD, "let it be known to you. Be ashamed and confounded for your ways, O house of Israel!"